Syracuse Abroad offers a residence hall housing option for students participating in the Syracuse Madrid program. Syracuse Madrid will reserve a block of rooms with two occupants per room. You will be assigned to rooms based on information provided on the Housing Request form (among the post-acceptance forms in your application). If there is more demand than space, we will conduct a lottery to assign spots. This option is especially interesting for students looking for a different kind of cultural experience. 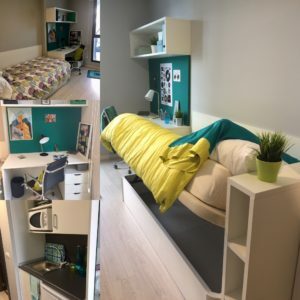 Here, students will have the opportunity to interact with Spanish university students and participate in sports and activities organized by the residence hall staff. Interested students are encouraged to submit their applications to Syracuse Abroad for housing at Colegio Mayor El Faro as soon as possible due to the limited availability of space. Although unlikely, if this arrangement does not work out, Syracuse Abroad will provide a homestay for all students in the program. All students who are placed in the residence hall will need to pay a $300 deposit and sign a housing agreement form to confirm their placement in El Faro.